So I’ll start off by saying I’ve only owned Keystone campers. Generally I’m ok with that. Had some big issues, but really which company don’t? However in the next year or two, my camping situation will be changing with the kids getting older. The wife and I want a decent quality short fifth wheel. Like 28” short. We still camp east coast state parks 90% of the time out. Don’t be led to think I’m looking for something for a half ton truck because we want a shorter campsite model. But we also don’t need a luxury model with 3-4 slide outs. We were recently inside a Fox Mountain 235RLS and absolutely love the floor plan/layout. One slide, and enough room for the both of us. Closest dealer is in the next state basically. So does anyone know of a similar size and layout Keystone that I should look at? I’ve seen some older cougars that were short, but haven’t seen a shorty at the local lots. Here's a link to Keystone 5th wheels. Just look over each model; all the floorplans are included for each one along with the specs. I had tried that once before, but just re-examined their site. I must be in a minority wanting a shorty, since most keystone lines start at 34-35 feet. They only offer a couple at 31’, and none of those the wife likes. If you click fifth wheel and move the slider down to 30’, there are no matching criteria, so I guess I shouldn’t have asked the question. We really like our Cougar 279RKSWE. Rear kitchen design has the most usable counter space. Dinette and sofa are in the living room slide. Bedroom has a closet slide. Lots of storage and very comfortable on long trips. Best part is the fridge and bathroom are accessible without having to open the slide. Makes on the road lunch stops super easy. Reasonably light weight and easy to pull and maneuver. Main box is 27 ft plus the 3 ft overhang into the truck. Makes a great couples RV. We were in the same situation as the OP- looking for SHORT. Until recently we only had truck campers. We highly value mobility, rarely staying in one place more than 1-2 nights. That is what TCs do best. But SWMBO wanted a true bathroom (not a "wet" bathroom), a couch to sit on and a bed that she didn't have to climb up into. 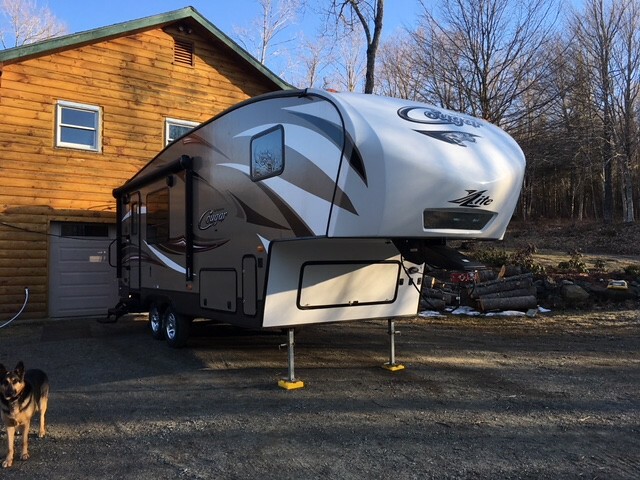 Found a VGC, barely used 2016 Cougar 25RKS, just under 28'. We had looked at Fox Mountain units but they are very difficult to find in the east and prices are about double compared to what we spent.